Something a little different from the normal varieties is Plumbago auriculata ‘Alba’. This is the White flowering Cape Plumbago an excellent plant for a frost free position. Good in coastal conditions and even grows well in poor coastal soils. 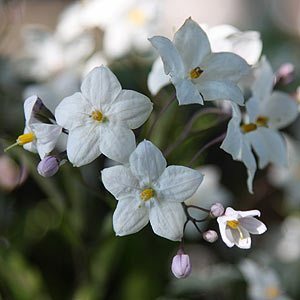 Also known as the Cape Leadwort, this is an evergreen shrub with attractive white flowers and a nice green foliage, it adds a lift to the garden in summer when in full flower. Excellent as an informal hedge, but this versatile plant could also be grown in a container and allowed to flow over the edges, or perhaps plant along a low wall. Not fussy about soil types, but the White flowering Cape Plumbago does require good drainage. During long dry periods a good soaking every week or two will help keep it in good condition. Pruning can be carried out as needed however a good heavy cut back in late winter to early spring will keep it in good shape and promote good busy growth. A general purpose slow release fertiliser applied in spring and watered well in will promote good growth. Flowering period – Spring though summer. Humus rich well drained soil with some moisture. Height – will reach 3m in height, however easily pruned to a much smaller size. Available for sale from the following participating nurseries.